Last year, my wife Stephanie and I attended the Focus on Diversity Conference in Minneapolis, and we are now making plans to attend this year's conference in McAllen, Texas from November 4 - 6. The 2012 event was fantastic and from the looks of the schedule, this year will be even better! 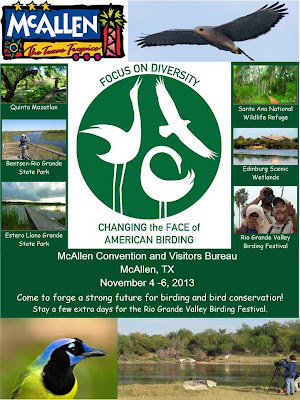 In addition to the usual conference activities, presentations and small group sessions, this year the conference will be offering workshops at local parks on the second day of the conference with topics ranging from "Engaging Latino Audiences in Birding Outings" to "Using Birding Festivals/Community Events as a Gateway to Nature". 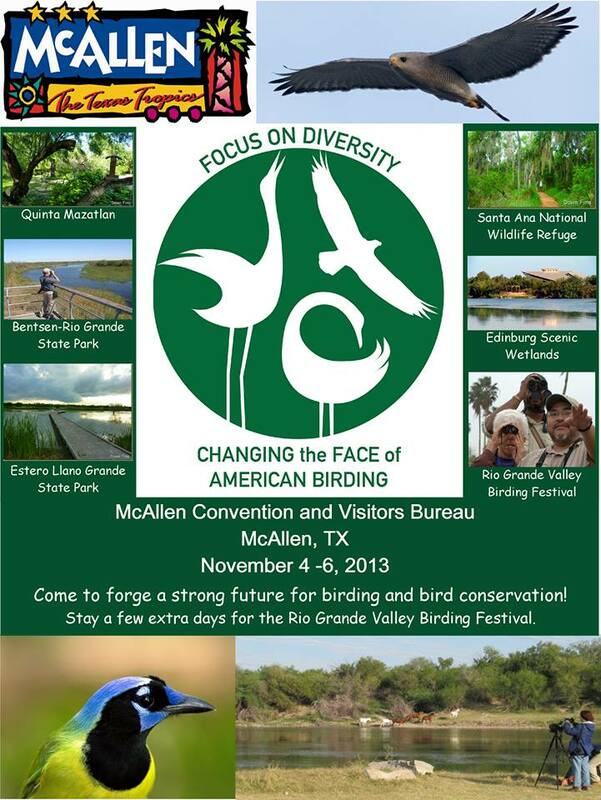 Participants will travel to one of the local parks in McAllen and work together and with facilitators to figure out how they can put these techniques in their own communities. Toward the end of the conference, everyone writes up goals and action plans that they can refer to when they get home to help them implement conference themes/activities in their hometowns. Other events will include several panel discussions, Kenn Kaufman talking about the creation of his Guia de campo a las aves de norteamerica, and a South Texas BBQ Banquet! We hope to see you in the Valley in November! Registration will open later this week. Check out the Focus on Diversity website here for more details.